The super-sweet newborn portrait of my littlest babe I was staring at today got me thinking about the maternity and newborn sessions I have coming up, and how crazy our schedule gets during some weeks when trying to fit in last minute sessions. 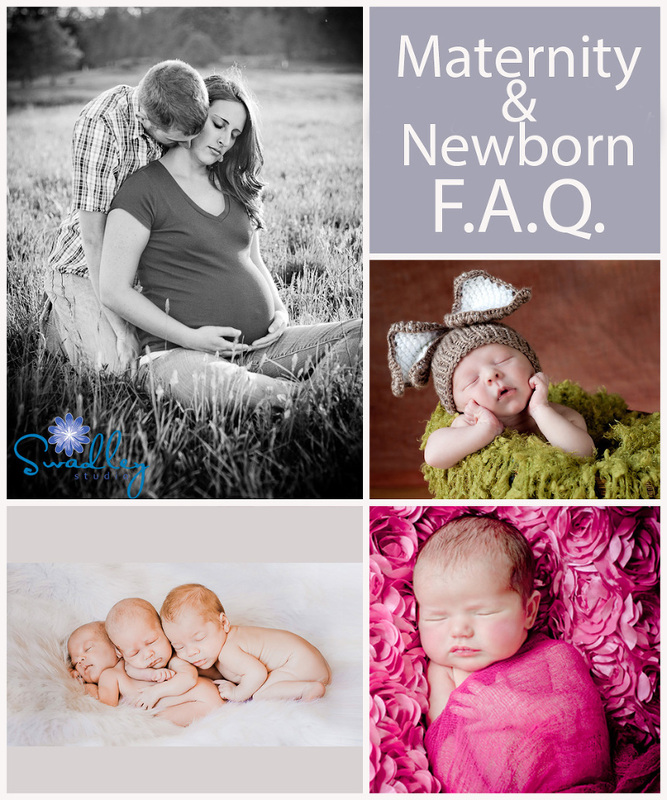 So let’s talk maternity/newborn for this next F.A.Q. segment! How many weeks pregnant should I be for my maternity session? How far in advance should I schedule my maternity session? Ideally, I like to schedule maternity sessions 6-8 weeks before the anticipated session date. This gives us plenty of time to plan the perfect maternity session for you. I don’t typically like scheduling out too far in the year simply because I love the freedom of being able to plan a family camping trip or attend an important event without working around sessions that were booked months ago. However, if you are set on having a date on the calendar 6 months in advance, I will certainly work with you to make that happen! Where do you do maternity sessions? Where we take photos depends on the type of shooting for and your vision for your portraits. All of this is discussed well in advance of your session. I love to do on-location outdoor photographs that let us maximize our access to natural light. This can be in a beautiful pasture, a quaint park, in the woods or even in urban settings. We can also do them in your home or in your favorite local establishment with their permission. Have you done Gender Reveal sessions? We LOVE these fun and creative sessions! Whether you wait for the actual session to find out if you are having a boy or girl, or if you are just using the session as a way to share the news with family and friends, these sessions are always a BLAST!!! If you are stuck on how to announce it, we have some creative ideas in our Newborn Guide that you can get by clicking the button below! Now scheduling is a bit different than scheduling maternity sessions. To get the typical sleeping baby lock that you see in today’s newborn images we need to get your precious angel in during the first 10 days of life before they lose the sleepiness and flexibility to be safely positioned in those cute curled up poses. After around the 10 day mark we can still do a session, but we expect a much different outcome for your images. While we can’t set an exact date for the newborn session 6-8 weeks in advance, of course, we can schedule a temporary time frame based on your due date. That being said, I do have new mommies contact me all the time from the hospital after having the baby to request a newborn session for their day old baby. Rarely can I accommodate last minute requests, especially April-December, but sometimes it works out so it never hurts to ask (plus, I have the best referrals for you if I’m not available!). For newborn session it’s best to choose a quiet and serene location that typically means either your home or my home studio. I love doing sessions in your home if there is ample space and window light. This way we can incorporate personal items found throughout your home into the portrait. However, I have a large array of props and sets to utilize in my home studio along with more options for studio lighting to provide more of a variety for you to choose from in your final images. What should we bring to the newborn session? As mentioned, we have a wide array of props and sets in our home studio, but there are other items that you can bring to make your session run more smoothly. This is found in our Newborn Guide which you can get for free by clicking the button at the end of this post. Is there anything special I need to do if my baby is breastfed? YES!!! First, let me say that as much of a breastfeeding advocate as I am, I love my formula-feeding moms equally! We all know what is best for our babies, so no judging here now if you do choose to breastfeed your baby, there are certain considerations to take into account. The most importantly being the food and drink that you consume. Even foods you eat a couple days before your session can have affect how well your baby sleeps while posing them in certain positions. I have compiled a list of things to avoid or limit in our Newborn Guide, which can be accessed for free by clicking on the button below. What if my little one is still in NICU? The 10 day rule has a few exceptions, one of those being the sweet little babies that need an extended stay in the hospital. Each baby is different so contact us to discuss your individual needs. We will work with you and your doctor’s orders to accommodate an appropriate time to photograph your precious bundle of joy in a safe environment! How much will I need to spend on newborn portraits? Our sessions start at $150 for a 2 hour maternity session and $250 for a 3 hour newborn session with a $100 gift credit. You will be able to view images and place an order at the viewing session for a wide variety of prints and products, including digital files. We don’t ever want to pressure you into spending more than your included $100 credit. While there is no minimum order requirement at this time, our average client ends up spending around $800 on their newborn portraits. All pricing can be found in our Newborn Guide which you can get for free by filling out the form below.